Sign up for WRD 225 to learn Bourbon’s multicultural backstories and how to write about Bourbon! This course introduces students to Kentucky's iconic Bourbon history and heritage and the many minorities--Jews, African Americans, Japanese, Irish, and other ethnic immigrants who participated in its development. Students will gain familiarity and practice in the genres of Bourbon writing. Additionally, students will be introduced to primary sources including the Kentucky Bourbon Tales and the Jewish Heritage Fund for Excellence Jewish Kentucky Bourbon oral history collections as well as the Schenley Distillers Corporation materials in UK's Special Collections and Resources. When we find ourselves in life situations of grieving, stress, or even crisis writing can become a refuge or the furthest thing from our minds. But even when we are not actively writing for an overt purpose we still produce bits of texts that can tell a story of our experiences in those difficult moments. Small Writing will focus on the pieces of mundane writing that we produce even during times when we resist writing, but nonetheless leave a trace of ourselves alongside those life experiences. From the beginning, Hollywood has been self-conscious about the lure of its often destructive and always reflexive mythology. What could be more natural than cannibalizing itself for source material? Movies about movies seem to revel in their own dark glamour, daring us to believe that only Hollywood would dare to show the rest of us back in flyover country what a special circle of hell Hollywood really is. We will be thinking about genre and gender, industry and Art, Cold War paranoia, the food chain of producers, actors, directors and writer, celluloid immortality and virtual death, with comic mayhem and tragic hijinks along the way. Films run from the ur-text A Star is Born to such noir classics asSunset Boulevard and In A Lonely Place to revisionist approaches like Barton Fink and The Player, culminating in such recent deconstructions as Mullholland Drive and Tropic Thunder. Books include The Day of the Locust, Suspects, and Zeroville. Expect loads of content, a little theory, lively discussion, two 7-9 page essays, two exams, and a final creative project. One of the most flexible genres in English, the essay is more than that paper you wrote for class last semester. It’s a tried and true genre for writers who want to explore their lives and the world. The essay is an approach to viewing the world, and a type of intellectual movement. In the preface to his Collected Essays, Aldous Huxley describes the essay as “a literary device for saying almost everything about almost anything. . . . Essays belong to a literary species whose extreme variability can be studied most effectively within a three-poled frame of reference. There is the pole of the personal and the autobiographical; there is the pole of the objective, the factual, the concrete-particular; and there is the pole of the abstract-universal.” In order to understand how those three poles interact, we’ll be reading and writing essays, practicing and analyzing the various aspects of style alive in the genre. 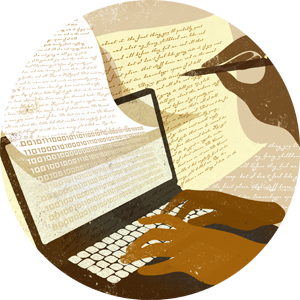 Students should be prepared to live and think as an essay writer during this course. So, buy a notebook and start looking around. Since their popular circulation in the early twentieth century, comics have served a vital function for marginalized groups. They have provided a vehicle for both rescue (a la the Superhero) and resistance. In this course students will learn about the creation of comics and long-form graphic narrative and the ways they have helped to circulate narratives that interrupt the status quo. We will read comics about resistance, learn to interpret and critique them, as well as how to create our own narratives of resistance. 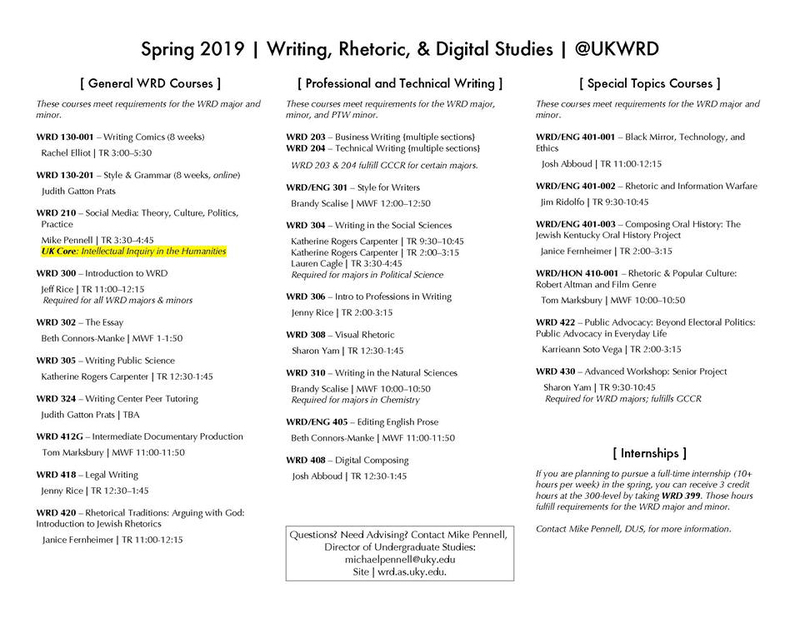 Selected texts may include Scott McCloud’s Understanding Comics, Art Spiegelman’s Maus, Joe Sacco’s Palestine, John Lewis’s trilogy March, Miriam Libicki’s Jobnik, Miriam Katin’s We Are on Our Own, Leila Abdelrazaq’s Baddawi, and the recent film The Black Panther. major, minor, and PTW minor. 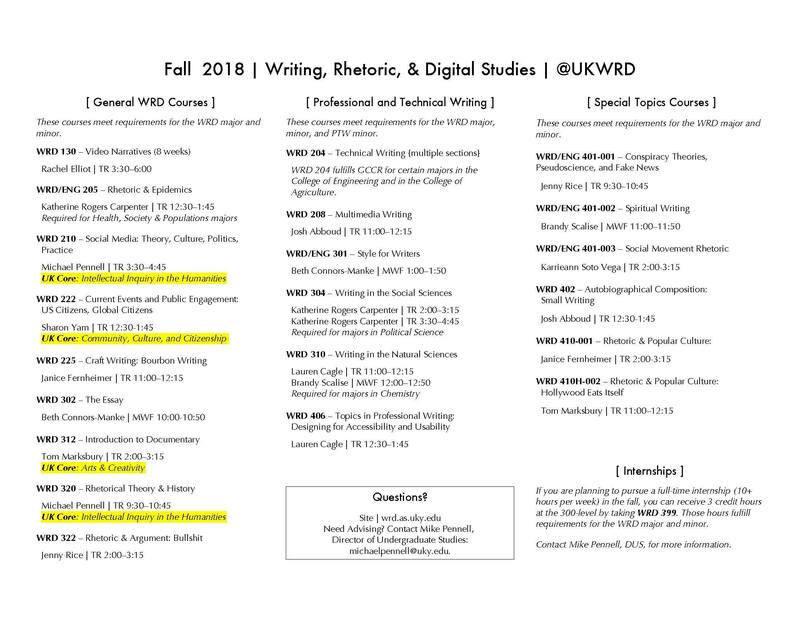 WRD 203 & 204 fulfill GCCR for certain majors.